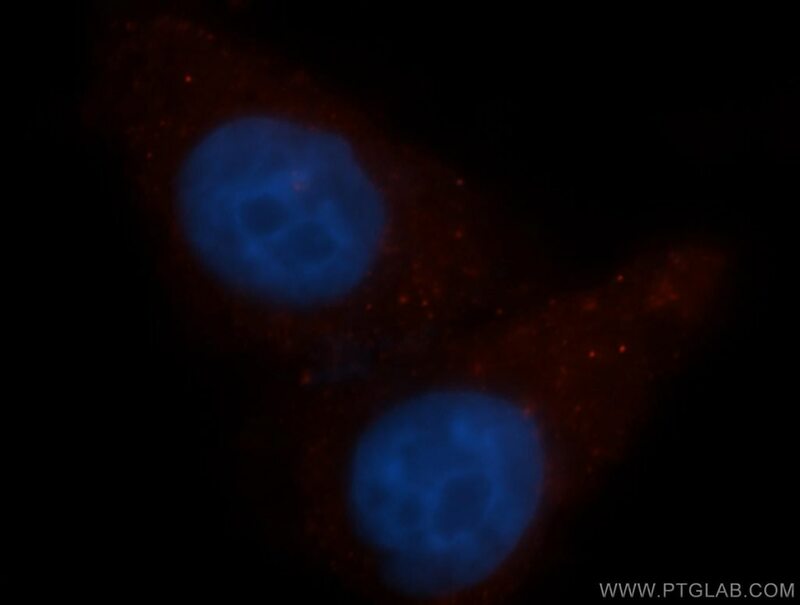 Immunofluorescent analysis of HepG2 cells, using CUL4A antibody 14851-1-AP at 1:50 dilution and Rhodamine-labeled goat anti-rabbit IgG (red). Blue pseudocolor = DAPI (fluorescent DNA dye). 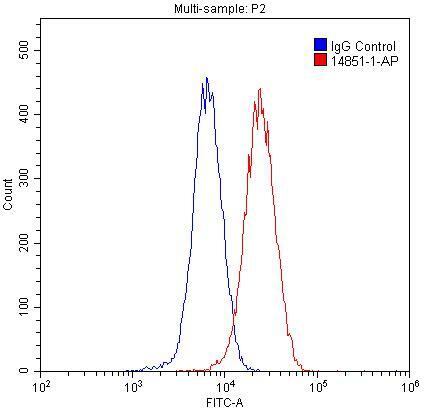 1X10^6 HepG2 cells were stained with 0.2ug CUL4A-Specific antibody (14851-1-AP, red) and control antibody (blue). Fixed with 4% PFA blocked with 3% BSA (30 min). Alexa Fluor 488-conjugated AffiniPure Goat Anti-Rabbit IgG(H+L) with dilution 1:1500. Cullin proteins assemble a large number of RING E3 ubiquitin ligases, participating in the proteolysis through the ubiquitin-proteasome pathway. Two cullin 4 (CUL4) proteins, CUL4A (87 kDa) and CUL4B(104 kDa), have been identified. The two CUL4 sequences are 83% identical. They target certain proteins for degradation by binding protein DDB1 to form a CUL4-DDB1 ubiquitin ligase complex with DDB. They form two individual E3 ligases, DDB1-CUL4ADDB2 and DDB1-CUL4BDDB2 in this process. CUL4A appeared in both the nucleus and the cytosol, suggesting a more complex mechanism for entering the nucleus. CUL4B is localized in the nucleus and facilitates the transfer of DDB1 into the nucleus independently of DDB2. 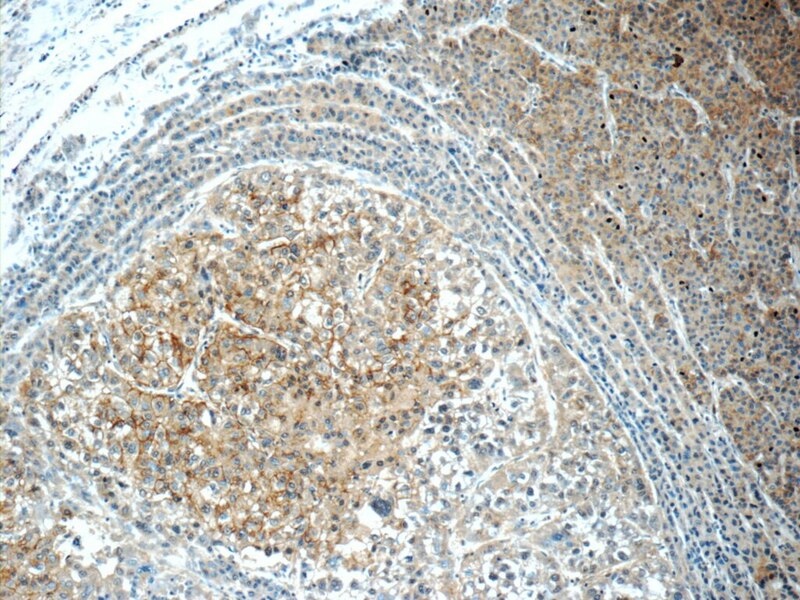 This antibody is specially against CUL4A,but not CUL4B. CUL4A has 2 isoforms with MW 88 kDa (759 aa) and 77kDa (659 aa), and Catalog #14851-1-AP recognizes both. Cul4 E3 ubiquitin ligase regulates ovarian cancer drug resistance by targeting the antiapoptotic protein BIRC3. Cul4-Ddb1 ubiquitin ligases facilitate DNA replication-coupled sister chromatid cohesion through regulation of cohesin acetyltransferase Esco2. APP may act as a substrate and a recognition unit for CRL4CRBN and Stub1 E3 ligases facilitating ubiquitination of proteins involved in presynaptic functions and neurodegeneration. COP9 signalosome subunit 8 is essential for peripheral T cell homeostasis and antigen receptor-induced entry into the cell cycle from quiescence. 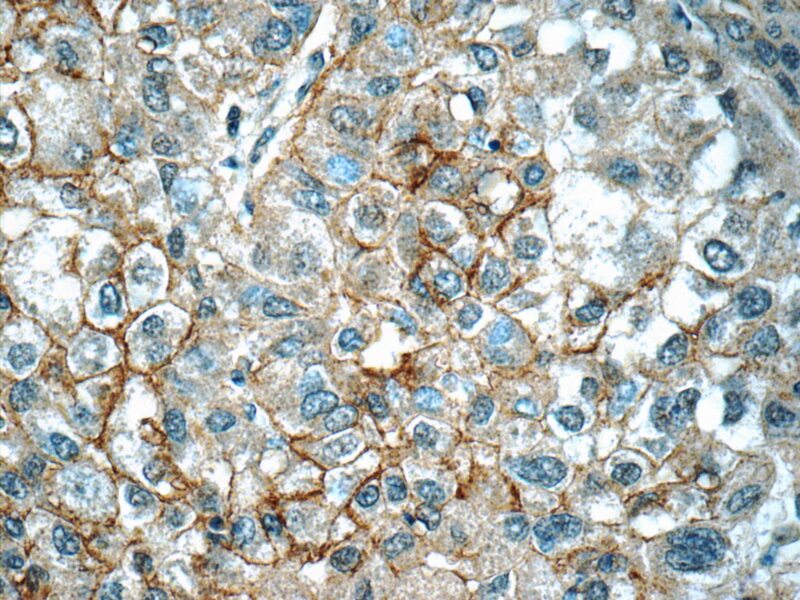 CSN6 drives carcinogenesis by positively regulating Myc stability.